Synopsis: A group of slackers face an army of zombies. The Cuban government and media claim the living dead are dissidents revolting against the government. Like its undead subject matter, the Zombie horror sub-genre continues to shuffle onto our screens at infrequent intervals, feeding voraciously on its own short but over-stuffed history with an increasing tendency for self-reference. It’s becoming increasingly difficult for filmmakers in the genre to distinguish themselves. In 2004, Edgar Wright’s Shaun of the Dead went some way towards re-inventing the genre by injecting a strong vein of self-referential humour into the obligatory gore. 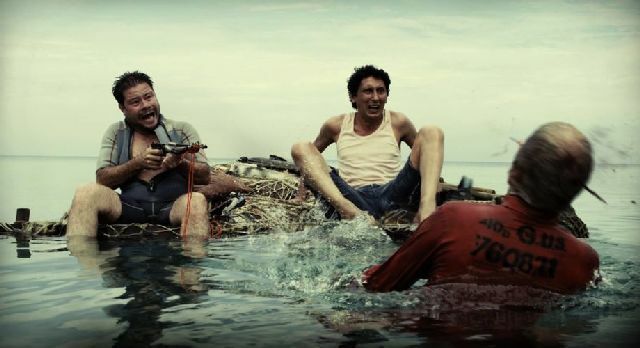 Now, a mere seven years later, that movie finds itself constantly referenced in Alejandro Brugues’ Juan of the Dead, the latest entry in the Zombie genre, and Cuba’s first. Sadly, the movie adds little that is fresh to the genre – other than a political subtext which will probably fly straight over the heads of non-Cubans. As if its title wasn’t a big enough clue, it’s clear that Brugues uses Shaun of the Dead (2004) as it‘s main point of reference in a film that’s littered with nods to a whole raft of other movies, many of which fall outside of the horror genre (both Die Hard and Lara Croft get prominent nods). Juan of the Dead’s heroes are cruder, less likeable, and the genre’s customary social satire is largely overshadowed by some heavy-handed political statements which leave you wondering just how the movie managed to sneak past Castro’s Socialist censors. There are a few memorable sequences – the accidental killing of an elderly neighbour whose husband is one of the earliest casualties, the sight of a small army of zombies wading slowly across the ocean bed (suggesting it won’t be long before Miami greets some unwelcome visitors), and a cleverly conceived mass execution of a massive crowd of the undead as they close in on our heroes – but by striving to emulate the matter-of-factness of Wright’s movie, Brugues too often warms over cold ideas instead of coming up with something new, and the humour – which may well be hilarious to Cuban natives – doesn’t travel well at all.